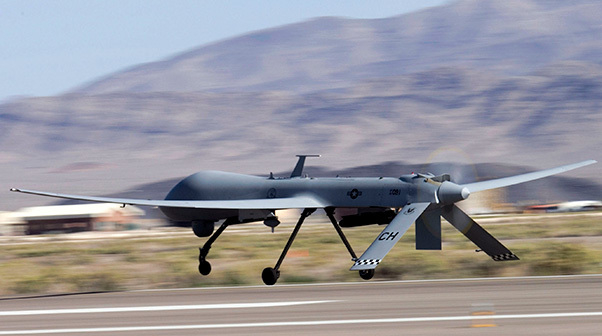 An MQ-1B Predator remotely piloted aircraft lost connection to operating flight crew systems and subsequently crashed in the Central Command’s area of responsibility Aug. 21, 2017, according to an Air Combat Command Accident Investigation Board report released Feb. 13. The mishap occurred while participating in a combat support mission and was operated by members of the 432nd Air Expeditionary Wing, Creech Air Force Base, Nev.
During normal flight operations, the crew permanently lost the ability to monitor and control the aircraft (i.e. lost link) while flying medium altitude approximately 90 minutes into the mission. The contractor, General Atomics — Aeronautical Systems Incorporated, completed analysis of the wreckage and determined the most likely cause of the accident was the failure of the primary control module, an internal aircraft component which is a critical part of the flight control systems. No evidence contradicted GA-ASI’s conclusion. There were no reported fatalities or injuries. The aircraft and environmental cleanup was valued at approximately $5.2 million.